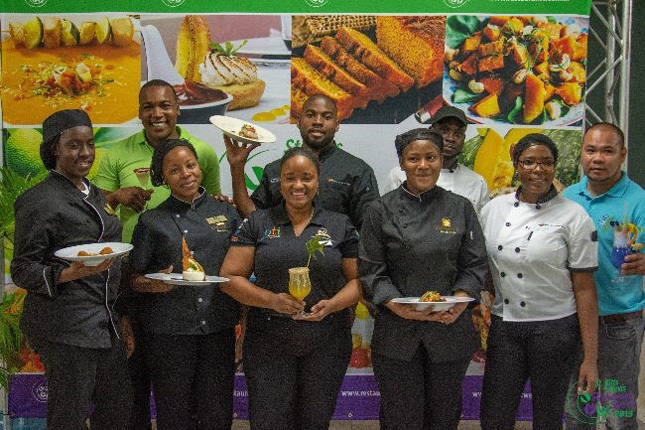 BASSETERRE(10TH APRIL, 2019): The organizing committee of the 2019 St. Kitts & Nevis Restaurant Week have revealed the finalists for the Coconut Cook Off Challenge. The 5th Annual SKN Restaurant Week will take place from the 18th to 27th July with coconut being the themed ingredient. Local chefs will prepare various coconut dishes, including deserts and beverages. Also during that period participating restaurants throughout the Federation will offer a special Restaurant Week menu at discount prices. Left to Right Finalists of the entree category from Coconut Cook Off Challenge: Cean Henry of the Royal St. Kitts Hotel; Leshona Davis of Carambola Beach Club, and Larry Monrose of the Royal St. Kitts Hotel. Left to Right Finalists of the beverage category from the Coconut Cook Off Challenge: Roshaun McKenzie of Carambola Beach Club; Stacie Little of the Ocean Terrace Inn and Garry Ogardo of the Royal St. Kitts Hotel. Shaquille Daniel was declared the winner of the appetizer category after having the highest score out of three participants. First Runner Up of the dessert category for the Coconut Cook Off Challenge- Tzulao Collins of the Royal St. Kitts Hotel.